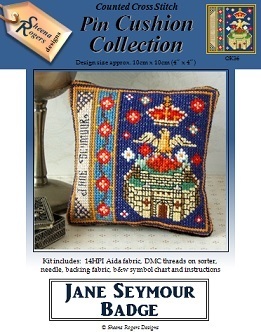 This pincushion design features the Badge of Jane Seymour, the third wife of King Henry VIII. The emblem shows a crowned Phoenix (symbolising rebirth) rising from a Castle (representing safety and spiritual power), between two red and white Tudor Roses. The design also includes a border of Tudor roses set against a deep Turquoise background, with Jane's name down the left hand edge, all framed with rich gold and sapphire blue threads.